In a move aimed at discouraging elephant handlers from bringing their animals into Bangkok, authorities in the Thai capital have recently introduced a new law stating that foreign tourists caught feeding elephants will be fined 10,000 baht (approximately £200). That’s a pretty hefty fine for giving a poor, starving pachyderm a 25 baht bunch of bananas or a corn on the cob!!! This practice has been going decades, despite the fact that the elephant owners or mahouts are already banned from bringing their creatures into the city and are supposed to face substantial financial penalties if they are caught. However, the owners often bride local police to allow them to work in the red light districts and other tourist hot-spots and when money is changing hands, existing rules and regulations are rarely enforced. Whilst I believe that elephants shouldn’t be roaming the streets of a busy, polluted city and I commend the authorities for trying to take positive action, criminalising tourists is not the way to tackle the problem. I am concerned that this will just become a revenue generating exercise and an excuse to line the pockets of those who are enforcing this law. 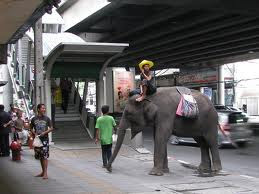 I would like to remind my readers that this law came into force on 1st July 2010, so if you do see and elephant wandering the streets, don’t be tempted to feed it unless you want to be 10,000 baht lighter!!! This story was widely reported in the British press and a good report can be read by accessing the link below…. If you are interested in elephant conservation in Thailand there is a fantastic organisation called the National Elephant Institute who run an elephant conservation centre in Lampang near Chiang Mai.